Romania’s president-elect Klaus Iohannis urged parliament on Monday (17 November) to scrap a corruption amnesty bill, moving swiftly to make good on a campaign promise and allay EU fears over graft in the country. Iohannis will be sworn in as president in December after he inflicted a surprise defeat on Prime Minister Victor Ponta in polls on Sunday (16 November), a result that will maintain a potentially destabilising split between the country’s executive powers. An ethnic German mayor whose campaign was backed by two centre-right parties, Iohannis turned around a 10-point deficit to win the runoff comfortably, as widespread anger at voting problems overseas appeared to galvanise the anti-Ponta camp. “I will prove Romania is a serious, credible and longterm partner,” Iohannis told reporters at a press conference. Analysts had said a victory for Ponta might have helped make Romania more stable, with the main levers of power held by one bloc. By contrast, although he distances himself from the outgoing president’s combative style, Iohannis’s win may trigger renewed political tensions in one of Europe’s poorest states. “The relationship between Social Democrat PM Ponta and centre-right president-elect Klaus Iohannis will likely be strained,” said Otilia Dhand at Teneo Intelligence. The election result was part of a pattern emerging in ex-Communist eastern Europe for voters to use the ballot box to stop any one group or individual from gaining too much power. In Slovakia’s presidential election in March, Prime Minister and frontrunner Robert Fico was trounced amid fears Fico and his centre-left party would amass too much power. The former Communist state of 20 million is emerging from painful budget cuts imposed during the global slowdown. Growth rebounded to more than 3% in the third quarter of 2014, but corruption and tax evasion are rife, and progress to implement reforms and overhaul a bloated state sector is mixed. Prime minister since 2012, the 42-year-old Ponta often feuded with his rival, outgoing President Traian B?sescu, which stymied policymaking and caused a constitutional crisis. The 55-year-old Iohannis had promised during the campaign to safeguard the independence of Romania’s judicial system and the fragile progress made in tackling corruption. 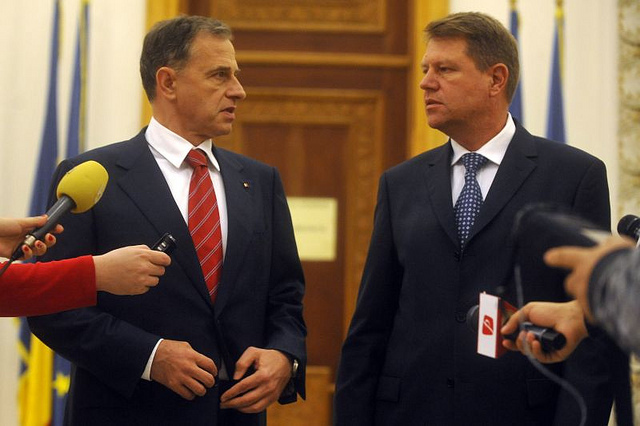 During the campaign, Iohannis tapped into popular anger over a 2013 bill that allowed for amnesties in certain criminal cases, providing a judicial shield for some politicians. He also pledged economic, health and education reforms, and to create an attractive business climate for foreign investors. But Iohannis as president will, like B?sescu, face a hostile parliamentary majority that could cause more policy wrangling. An early flashpoint could be the 2015 budget, in which Ponta will have to balance spending promises made during the election campaign with an EU commitment to fiscal discipline. His government might also cut loose an ongoing IMF aid agreement that is due to expire next year.